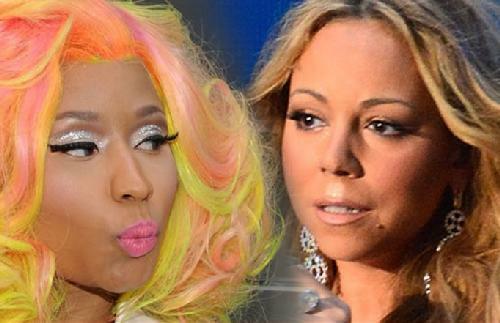 *The drama between Nicki Minaj and Mariah Carey is getting deeper and just plain scary. Minaj’s rant on the “American Idol” set in Charlotte Tuesday went way beyond name-calling (see video below). Sources connected with the production tell TMZ she threatened Mariah Carey’s life. A source close to Nicki says the singer calls B.S. on the death threat allegation against Mariah. Mariah g’on get huh azz whooped, demanding “certain colored jelly beans”,water teperatures & shyt! Chick! ?, this ain’t the nineties & you ain’t “hot” no moe! Be glad you GOT that gig & eithah act right?, or….watch yo back & be ready to scrap! (Meanwhile….) Yo Nik?, go take yo meds, mah! “Marvin” wasn’t hired…YO azz was. Chuuuuuuch! Ps…:.I got fiddy dollahs that says, one or BOTH will be replaced, soon. Who wanna bet!? Yes, I believe one will be replaced and predict it’ll be Nicki. Nicki will then sue Idol over the termination and claim show execs knew she was bipolar from jump. Nicki is crazy, thank God she don;t have kidz Mariah you have too much class to beef with this trash Nicki Minaj.Mariah do not make your self look bad, walk away from this crazy trash. I hope this is all a publicity stunt, although I don’t know WHY it would be. I say kick Nicki to the curb and bring back Jennifer Lopez!